Feats of Daring and Bravery! I braved the mall today. I am almost completely done with my shopping, but there are always a few things that elude me, or that I think of at the last minute. So I made a list, checked it twice, ate some extra protein, and left for the mall. Without my list. Luckily, since I’d checked it twice, I remembered everything. I went to Colonie Center, where I had moderate success. I found an earring holder for J. But I couldn’t find an accessory for M. She is picky. And I’m bitter, because I wanted that bracelet that I’d seen at Bumble Beads back in the spring. But when I called to store the see if they still had any, the lady basically laughed at me. Oh, how naive! You think that we might stock the same item 6 months later? Clearly you don’t understand retail! What makes it even worse is that I saw the same bracelets when I went with Mary to the Sweater Venture. But I was afraid to buy it, because I knew that Mary would try to treat me to that, too. And I’m not going to schlep over to East Greenbush for one little bracelet. I thought that perhaps they’d have a similar bracelet in one of the many, many, many stores at the mall. Nope. Anyway, I did enjoy my visit to the newish-but-not-completely-new Treasure Ayeland store. It has good toys, including these groovy MAKEDO Find & Make sets. They looked so fun that I was a little bit sad that I was done with my main toy shopping. Especially since my kids are constantly creating things like this, anyway. As of late morning on Friday, the most insane stores were Christmas Tree Shops and Bath & Body Works. I almost broke out into hives trying to escape B & B W.
After Colonie Center, the bravery continued as I proceeded to the Target shopping center across Central. 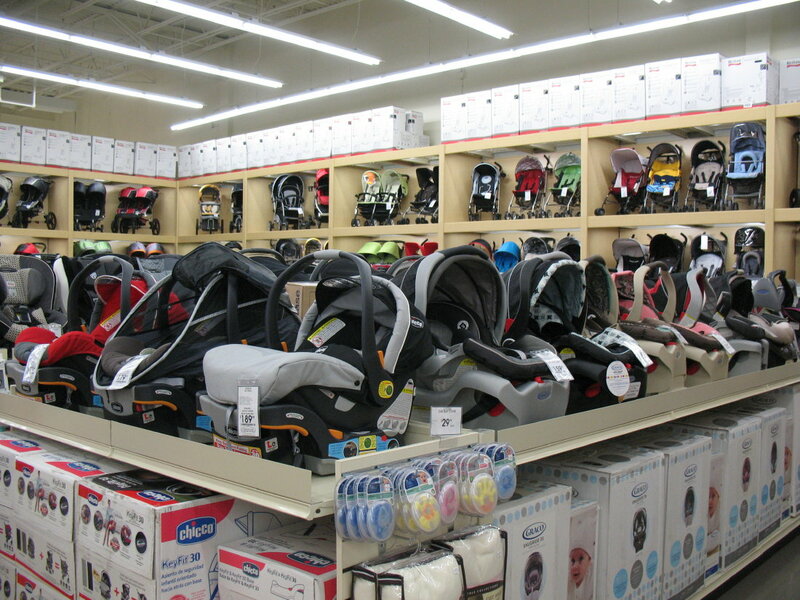 I made my first visit to Buy Buy Baby. 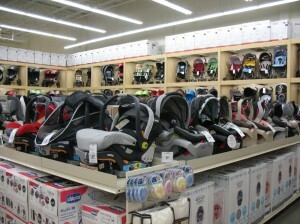 I have to say that I’m emotionally attached to BBB because it’s where I shopped for M’s baby things. Of course, that was back when there were maybe one or two stores in New Jersey, and now it’s been bought out by Bed Bath & Beyond, but it still holds a place in my heart. Anyway, my new nephew needs a baby book, and although I’d found an adequate one, I guessed (correctly) that there would be better options here. Speaking of options, how about this? I turned the corner and saw this display of car seats and strollers and I had to laugh because it just looked way too overwhelming. Of course, this is coming from a woman who made a postpartum Target trip in which I burst into tears because I couldn’t decide which recycling container to purchase. I am not kidding. In fact, moments later I actually wet my pants right there in the store. So if there are any new mamas out there who think that they’re not doing a great job of Coping with Daily Life, just think of me, leaking my way through the recycling-container aisle, and perhaps it will give you some needed perspective. You’re welcome. Anyway, I made it home from the mall. Yay, me! Then I got home and I felt like I needed a little break, so I scarfed down some lunch and started writing something. And I completely lost track of time, so that when my daughters arrived home, I had a pile of shopping bags still sitting out in the middle of my house. I realized immediately and panicked and had to fight them off as I ran upstairs and stuffed them in a closet, but it was like sharks that have smelled blood. Suddenly they were wild with the need to find and ravage the shopping bags. I needed a diversion. 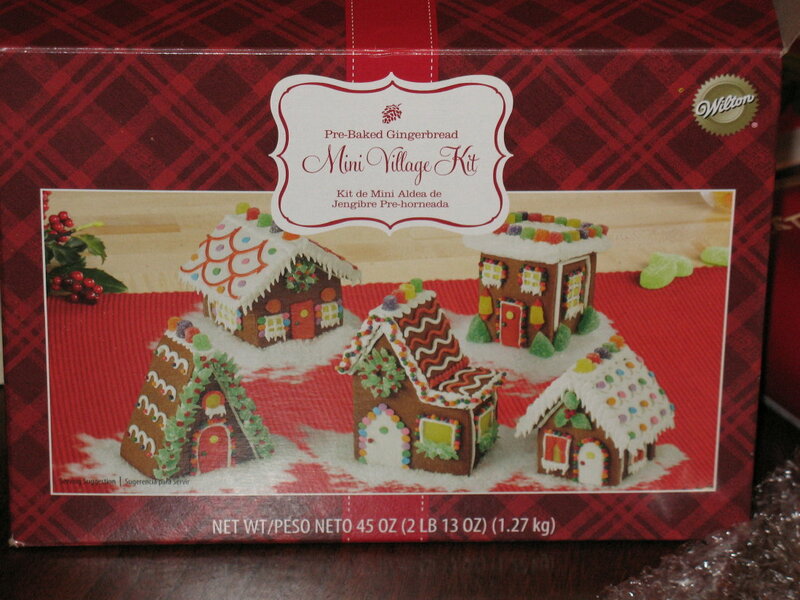 And so I moved into my next Act of Bravery and declared it Gingerbread Village Time! Yeah, baby! This was my first time doing this project with a kit, and it was absolutely so completely and supremely worth it. Is that emphatic enough for you? Am I making myself clear? 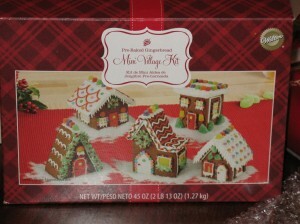 It’s funny: on their website, it says that this kit is $17, but I got it at Wal-Mart, and I could have sworn it was $8 or $9. It absolutely wasn’t more than $12, for sure. Anyway, I was pleasantly surprised by the entire process. 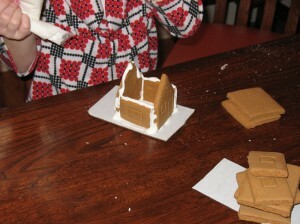 The gingerbread was cooked and stamped into the pieces, so you just had to break them up, make frosting, put them together, and decorate. Which could have been a nightmare. Because I’ve assembled houses like this in my day. But it was easy. First, I saw those crispy sheets of gingerbread and feared that they would break in the wrong places. But they didn’t, and I wasn’t that careful. Then the frosting was a just-add-water-and-mix thing. I can do that! They included two little pouches for squeezing out the frosting, but in a pinch you could use extra plastic baggies. The assembly was so easy that the 8-year-old did it with no help at all and the 6-year-old only needed me to hold pieces in place occasionally when she got bored. 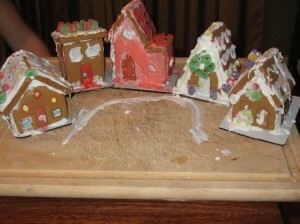 After constructing the houses, you were supposed to wait an hour before decorating. My only problem was that I’d made both frostings at once. I should have waited on the red frosting until it was time to decorate. But I added some water and it was fine. If you are looking to entertain some kids and/or kill some time on Christmas Eve waiting for bedtime, I highly recommend one of these kits. All three girls had fun. Love the village. 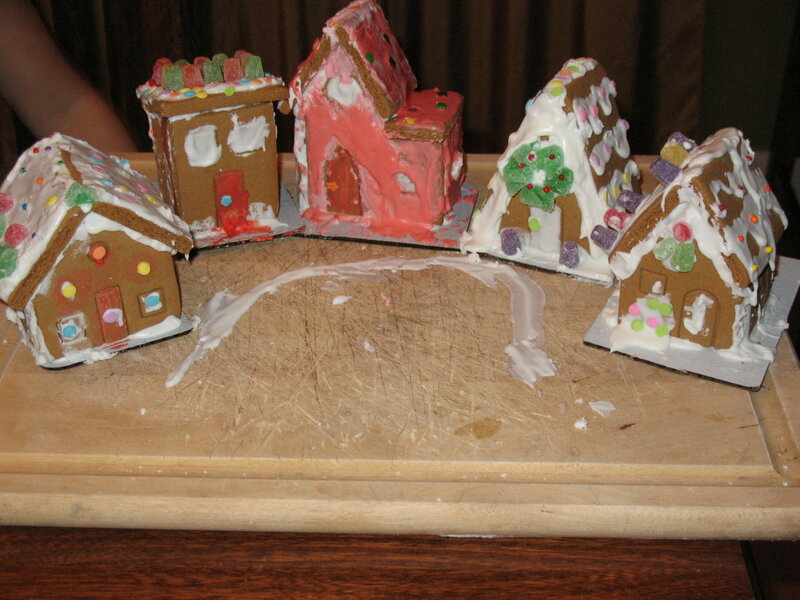 that’s just like the gingerbread train that I did with the boys. Although we did have some breakage of the parts – thanks be to my father – so there I was “glueing” with electric green icing small pieces of crusty gingerbread together to reclaim the side of my locamotive! But it WAS fun and turned out not half bad. I have the photos up on here actually. You are very brave for hitting the mall at this time of year! I can only imagine how crazy the Christmas Tree Shop must have been. I really liked the article you wrote about parenthood. I just hope you’re wrong about only-children being lonely; my son unfortunately is an only child, and I worry about this a lot.